This is a true story about how 12-year-old Darci Lynne Farmer gave my brilliant next-door neighbor hope for a future he would not live to see. A sparkling YouTube video of the Oklahoma City ventriloquist’s audition for America’s Got Talent would be the last video he would ever watch. Herbert I. Jacobson had turned 86 nine months earlier. He looked and seemed to be in his sixties rather than shooting for the tenth decade of life. He never once needed hospitalization, but in May he became dehydrated and required hospital care. After being re-hydrated and stabilized, his physicians sent him home for a quick recovery. Yet he did not get better, and within another week he needed emergency hospitalization, this time for severe electrolyte imbalances. A life-threatening situation spiraled out of control, leading to deterioration of his kidneys and heart. Physicians declared his condition terminal. 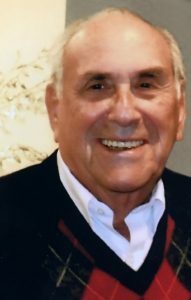 When we walked into the Intensive Care Unit at St. Joseph’s Hospital that bright June day, he seemed as lucid as I remembered him during our many conversations and neighborhood gatherings spanning more than two decades. He was engaged, intellectual, funny, and circumspect. His animated chat careened from philosophical to silly, connected to transcendent, and physical to existential. Within minutes after our arrival, Herb launched into a conversation that Dr. Robert Butler described as life review. Dr. Butler, a Pulitzer Prize-winning author and psychiatrist, identified life review as a cathartic process that helps those diagnosed with a terminal condition affirm value and meaning in their lives. When she was a child, his daughter became inflicted by Gaucher disease (pronounced go-SHAY), more likely in people whose ancestors originate from the Ashkenazi (Eastern European) Jewish population. Herb had tirelessly lobbied, fund-raised, cajoled, and pleaded for financial support to fight and treat this cruel disease. He testified before Congress, pressing elected officials until the nation’s legislators agreed to support funding for The Metabolic Clinic at Children’s Hospital Colorado, recognized internationally for its expertise in diagnosis and treatment of metabolic disorders. A former school teacher who loved teaching children, he had sometimes shared his grave concerns about the future. A child of the 1930’s, raised in a New York orphanage, he knew deprivation on a level most cannot comprehend. He had spent formative years enduring hardships without parents and stable surroundings. He grew up scrabbling for means to a good life. He believed that the US Constitution does not automatically transfer from generation to generation with inviolable guarantees. He was concerned that today’s digital distractions and cultural narcissism might crumble the nation’s foundations. A young generation lacking rigorous liberal education, rich with history and its lessons, worried him most. Five days before Herb died, this twelve-year-old girl from Oklahoma City, Oklahoma, appeared on the twelfth season premiere of America’s Got Talent, a reality show on the NBC television network. The popular talent contest features singers, dancers, magicians, comedians, and other performers of all ages competing for a top prize of one million dollars and a chance to headline a show in Las Vegas. Then she looked at her animated puppet and said, “Are you ready?” Petunia replied, “Hit it!” as orchestral music lifted. Darci Lynne feigned surprise by saying, “You’re going to sing? Oh, boy!” Suddenly Petunia opened her mouth wide and began singing Summertime. As Petunia astounded the audience, Darci Lynne smiled sweetly, innocently. The five judges became flabbergasted, not quite believing that a petite child, so young and inexperienced, could sing with such force and in tune without moving her lips. Not once. She demonstrated poise, self-confidence, rapport with the judges and audience, shocking mastery of ventriloquism for such a young age, an uncanny ability to split her personality between Petunia and the real Darci, all while achieving vocal range beyond the reach of most children. Her song seemed perfect for the tastes of a dying man who had spent years cherishing music that helped define his youth, causing him to eventually store over 35,000 jazz and Big Band recordings on his beloved iPod. Summertime, an aria composed in 1934 by George Gershwin for the 1935 opera Porgy and Bess, is one of the most covered songs of all time, with interpretations by performers ranging from Ella Fitzgerald to Janis Joplin. After she finished, studio audience members jumped to their feet and honored the gifted girl with a standing ovation. Her shy giggles transformed into Bambi tears. Speaking in turn, each judge praised her for a charming performance. Judge Mel B said, “You make my heart melt. You were brilliant! I’m trying to describe how amazing it was. You know what?” Mel B jumped up and slapped a buzzer. The Golden Buzzer may be activated only once by each judge per season. Mel B’s buzzer slap meant that Darci Lynne would advance to the final live shows without needing to compete at lower tiers. As gold confetti rained from the studio ceiling, the Oklahoma City girl became overcome by sweet emotions: disbelieving, crying, squealing, and jumping with joy. Herb was charmed and astounded by her talent. He was uplifted by her bold and sophisticated interpretation of a hit song from his youth. His final request was for me to share this video with Sharon, his wife, soon after he passed away. An amazing ninety minutes concluded as he weakly transferred from a recliner to his hospital bed. A few others in the room began to weep. He saw this sadness and said, “I’m sorry … I’m sorry.” These two words expressed his regret for leaving his family yet revealed courage that he had accepted his fate. Our goal should be to live life in radical amazement. Get up in the morning and look at the world in a way that takes nothing for granted. Everything is phenomenal; everything is incredible; never treat life casually. To be spiritual is to be amazed.